"Aladdin and the Wonderful Lamp" recounts the tale of a poor tailor's son who becomes a wealthy prince with the help of a magic lamp he finds in an enchanted cave. 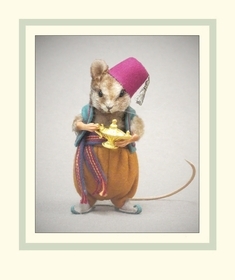 Created in the form of a mouse, Aladdin is made of fine mohair plush with realistic shading, resin hands and feet, German glass eyes, inset whiskers, and a leather tail. Measuring just 3 inches tall, he is jointed at the neck and shoulders. A built-in metal stand provides effortless display. Aladdin is wearing a delightful Middle Eastern costume made of custom made all-wool felt and holding a magic lamp. He wears 'Salwar' trousers, an embroidered vest and sash, Arabian slippers and a fez hat. Produced as a Limited Edition of only 150 pieces, he'll come in a deluxe presentation box with the accompanying signed and numbered certificate of authenticity and the forms for owner registration.